Brentwood Country Club adds a picturesque backdrop to wedding ceremonies, receptions, corporate events and social gatherings small and large. 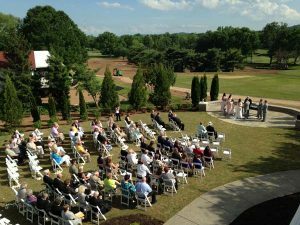 BCC offers full event services to members and non-members alike. Our experienced and creative staff will be there for you to make planning easy and stress-free. We listen to your needs and pay close attention to detail in order to make your wedding, family celebration, social or corporate event special in every way. The Club can accommodate events ranging from 10 to 250 guests in a variety of settings. You and your guests can enjoy cocktails and the view of our golf course out on our events lawn. Our two banquet rooms provide the perfect setting for a variety of receptions and events. The Club’s unique wedding packages help you bring your dream wedding to life. Here at Brentwood Country Club, we think of every detail so you don’t have to. For a private tour and consultation, contact our Events Department. Email Courtney Cooper or Katie Heilig for available dates in 2019, 2020 and now booking in 2021! Brentwood Country Club also hosts a limited number of corporate outings and charity golf events on Mondays from April through October.